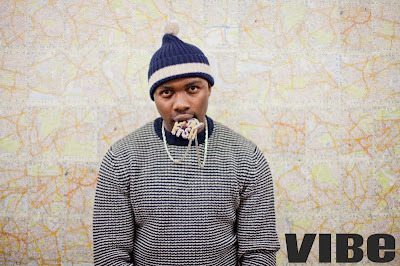 I know it's been a while, VIBE.com, but I’m back to give you guys the lowdown on some of the finest UK rap talent. This month is all about the one they call, G FrSH. Although he’s been around for a few years now, the EMI/Parlophone-signed artist is ready to cause some damage to the music industry, with his money-focused lyrics and laid-back style. The south London rapper tells me his story... G FrSH: Growing up, I was never really interested in music. I didn’t even really listen to music until I got a car because, at the time, we never had a CD player in the house. Back then, CDs were like £15.99 – but you would rather save two CDs money worth and buy yourself a nice jumper instead. There was a guy from my area who used to make beats on his PlayStation and, as stupid as it sounds, I thought, 'Rah! This sounds like real beats. This sounds like music!' So I went and put my own money behind him so that he could try and get himself out there more. Spending time in the studio with him, I suppose I just caught the bug. One day, in a uni lecture, I decided to write a bar and the rest is history. Musically, Jay-Z influenced me a lot. It was relating to what he was talking about on my level. I listened to a lot of other rappers, but none of them made me want to do music more than Jay-Z. He was talking about his reality and, seeing as he had the right to talk about his reality, I felt that I had the right to talk about mine. My music, on the most basic level, is just like the rap that I grew up listening to. It was very money-orientated and materialistic. But I’m widening my musical tastes out now, it’s broadening. It’s just about trying to express different parts of my story, and only my story. It’s just trying to convey that to people for their entertainment or education, however they want to see it. I think the music scene is definitely ready for me now. Whereas I'm one of the pioneers of the slick talk now, when people like Skinnyman and Klashnekoff were reigning, I was very much going against the grain. People wanted to hear struggle and all of that, but that wasn’t me – my life was cool. For me to now come to the forefront, I think it must be a time when it makes sense. The Legoman mixtape did a lot for me. Prior to that, I wasn’t as good. My flow and delivery needed a bit of work, but I was always on point when it came to my lyrical content – it was just my delivery and confidence in the booth. I think I’ve improved a lot, though. When it comes to my videos, the main thing is to be true to yourself. I think with a lot of artists out there, and this is no disrespect thing, if you’re going to talk about all of this money, then you should be able to see it in your product. It shouldn’t just be your content. If I'm gonna talk it, then I've got it. I'm not gonna half-step. I can’t call myself G FrSH and everything not be like that. Put your money where your mouth is! I got signed to Parlophone/EMI because I put a lot of hard work in over the years. I put a whole bunch of money and work into my music and it just kind of fell on deaf ears – or the ears that it did fall on weren’t enough to create a buzz and taste make the situation. Then I somehow found myself a lot on the Internet, and I started to gain a fanbase of people who listened and took notice. I have to say, that really come from me doing an F64. Before I did my F64, though, a song was floating around and I don’t even know how it got to the labels, because it was a rough and unfinished version. From there, everybody just wanted to get in on the action! I went with the A&R who basically just bounced to the right beat. My deal is different from most artists, in a sense that I have a lot of control over it. I'm still essentially myself, because the label doesn’t own people and I earned that right because I still do so much myself. It’s more of a business relationship, rather than a label/artist kind of thing. There’s a very strong, competitive element in the UK right now and it came at a time where the US wasn’t really doing much. There was a time when rap was just in the air. Nas was saying that hip-hop was dead, and it seemed like a valid statement. It’s only now that it has been somewhat revived with the different types of rappers: Wacka Flocka Flame, Kendrick Lamar and everyone in between. At this stage, no one is gonna do it for the love. If I had to pay, at this moment in time, I think my money would be better spent on a Rihanna or Lady GaGa collab. For the love, really and truly, I suppose I’d work with anybody in hip-hop doing their thing. But on a money level, it has to be pop. I think my aim for the next months is just to naturally progress. I'm in no rush, I'm not starving. As much as I would like a cheque as much as the next person, I’d rather have a long career. My main aim is to build my foundations and fanbase properly. I’ve been in no rush to put out anything simply because I don’t wanna just put out a single and have a number one hit. If it happens in a short space of time, then so be it, but I just want it to be the most natural progression. I’ve got an EP out called Purgatory, and hopefully it’s going to make people aware of my musical diversity. Then I’l take it back to the Legoman type of vibe, because I know that’s what people like. Very shortly, or in between that stuff, there will be a single. I’m also supporting J. Cole on his UK tour in November, so I'm 100% ready to take on 2012!